Adopting a pet and welcoming them into your home is a big responsibility, but one that is full of rewards. Adopting a pet is a lifetime commitment. Please review The Average Cost of Pet Ownership before committing to adopting a new pet. All pets are spayed or neutered before leaving the SMVC. All pets are fully vaccinated depending on how long they have been at clinic. We groom (dip for fleas and ticks) and treat for intestinal parasites. We work very hard to ensure our adoptable pets’ good health. All dogs are tested for heartworms and are put on Heartworm preventive. All cats are Leukemia/Feline Aids tested. We screen potential adopters very carefully and we reserve the right to refuse an adoption. No animal will be adopted into public housing in compliance with VI Code Title 19, sec. 2615b. 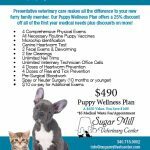 The Sugar Mill Vet Center will refuse any further adoptions if the adopter has not honored the terms of the adoptions agreement or contract. You will provide us with a Picture ID at time of adoption and General delivery is not considered an address. A phone number to contact you is mandatory. Please READ what you are signing. We reserve the right to refuse any adoption. All Cash and check or debit and credit cards Transactions must be acknowledged by a receipt. The adoption fee for animals is $50.00 of which a non refundable deposit $30.00 must be given up front for processing purposes. We accept cash, checks, debit and credit cards. Bath and Dip and nail trim. We are looking for a lifetime commitment on all of our adoptions. However, if the adoption does not work out due to unforeseen circumstances, we ask that the animal be returned to Sugar Mill Vet Center. On occasion an adoption won’t work out. If you feel you have done everything to make it work you can return the pet at your convenience. At managers discretion you may or may not get a refund. You are responsible to make sure that the pet you are choosing is compatible with your needs.